Whether your marketing budget is small or large, it’s always a good idea to make your efforts go a long way, and that is more possible than ever with influencer campaigns. Content produced by influencers during a campaign can be used again throughout the duration of your product campaign, and might even be worth using in perpetuity if it fits your brand’s overall image. Repurposed influencer content increases the value you get from your campaign, and has been proven to drive further sales. If the contract says nothing about ownership or intellectual property rights, then the influencer has the copyright on that content and all rights associated with the copyright. You can create a new contract to buy or lease the content rights if it wasn’t stipulated in the original contract but it’s best to save yourself some time and think of this before you start your campaign. With an influencer campaign plan and contract in place you should know how you will repurpose your content before it is even published. We’ll dive into a couple of these marketing tactics to explain how repurposed influencer content can push the needle further and drive ROI. 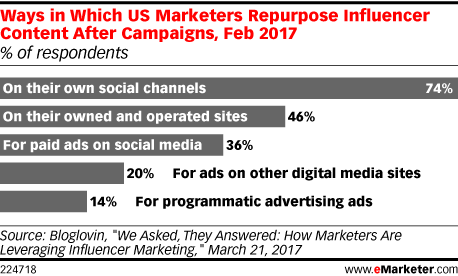 In February 2017, BlogLovin’ conducted a survey, which asked marketers how they repurposed influencer content after a campaign. The results, posted below, revealed that 74% published the content on their brands’ social media platforms, and 36% for paid ads on social. Publishing content from an influencers, beyond the end date of the campaign, helps the brand reach a new audience, and continue to engage the influencer’s audience who enjoy seeing the brand promote their photos, videos and posts. Acorn partners with digital media agencies to use influencer generated content in paid media campaigns. Together the teams closely monitor the usage and analytics of the content being used in ads. Results from a/b tests have shown that Acorn’s influencer content significantly outperformed non-Acorn media for store promotion, and lifted sales by over 4%. Influencer content performs so well because it resonates with their audience. The influencers know exactly what kind of photos, messaging and videos work best with the target audience, because they have spent time developing a strong relationship with their followers.